Beijing - The State Owned Assets Supervision and Administration Commission (SASAC) announced a major reshuffle yesterday in senior positions at power generator Guodian Corp, mining company Shenhua, the country's largest food trader Cofco and a leading chemical company SinoChem. The news followed Aug 19 changes at the top in the most senior managers at China National Offshore Oil Corp (CNOOC) and China Mobile to separate the roles of CEO and chairman. Fu Chengyu resigned his position as chief executive of CNOOC, a sign that he is gradually stepping aside to make way for new leadership of China's largest offshore oil and gas company. Fu is keeping his role as chairman of the company, while his CEO position has been filled by Yang Hua, the former chief financial officer. Industry analysts said the change in leadership was signaled in May when the SASAC announced five promotions within CNOOC. At another State-owned giant, China Mobile, Wang Jianzhou followed suit the same day, replaced by the former vice-president and general manager of the company Li Yue. The widely expected move completes a reshuffle aimed at handing leadership of the carrier to a new generation and improving its corporate governance. Yet over the past few years several companies have appointed new CEOs who are not chairman of the board. The news that Fu will relinquish the title of chief executive comes after a round of similar announcements as SASAC encourages State-owned companies to separate the roles of chief executive and chairman of the board. 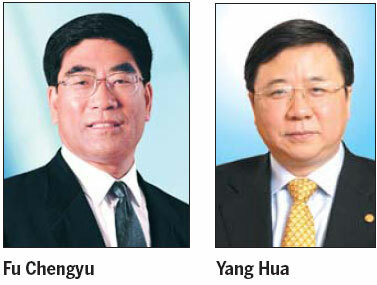 Yang's promotion marks a departure from the previous CNOOC promotions in which a new chief executive would simultaneously be appointed chairman of the board. 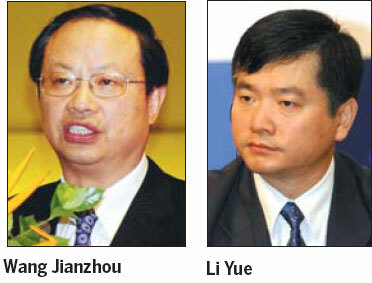 In May, China Mobile created a board chaired by Wang, who was also CEO of the company's listed unit at the time. Li, 51, takes over amid slower growth and sliding profitability in the Chinese telecom sector. He is a veteran at China Mobile and has worked on network construction, maintenance and corporate development, the company said. China Mobile, the market leader, reported 7 percent growth in net profit for the second quarter. China Mobile said revenues from music downloads and other value-added services increased more than 13 percent, contributing close to 30 percent of the company's operating revenue in the six months to June. The company aims to strengthen value-added services to help make up for declining average revenue per user. Fu, 59, who has been chief executive since 2003, spearheaded CNOOC's failed bid for Unocal in the US and led the company through a period of rapid growth and overseas expansion, including the acquisition of a 50 percent stake in Argentina's Bridas for $3.1 billion in March. People close to the company suggested that the move was a normal progression, not necessarily linked to SASAC's governance reform efforts. CNOOC spokesman Jiang Yongzhi declined to comment on Fu's roles in the CNOOC parent group, which owns a controlling stake in the listed entity and also controls China Oilfield Services Ltd.
Yang, 48, has worked extensively overseas and is likely to continue the focus on international expansion. He was deeply involved in CNOOC's listing in 2001, gained a master's degree at the MIT Sloan School of Business and ran CNOOC's operations in Southeast Asia for several years. CNOOC reported net profits were up 110 percent to 26 billion yuan for the first half of this year. Production rose 40.8 percent year-on-year.